Ogra Colmcille were comfortable winners over Dolans in an eventful game at Drumsurn. The winners were fitter and more cohesive now with a second comfortable win under their belts and they look good enough to give the championship a real rattle. 1-15 against Doire Colmcille and the same against another city side have shown that Ronan Devlin has been pointing his players in the right direction. The man who made Ogra tick was outstanding centre half back Shane Devlin, his driving runs up the centre earned and set up scores for the bearded and experienced flankers Stephen and Thomas Devlin. The Creggan men never really looked like making a real challenge despite a lot of effort. They coughed up too many needless frees and never really functioned as a unit despite good displays from the likes of Alan Grant, Joe Gallagher, Sammy Robinson and keeper Dave McGilloway. They had the experienced Ciaran Wilkinson yellow carded with ten minutes remaining but at that stage the game was out of their reach. The winners playing into the slight breeze led at half time by 1-5 to 0-4. Their goal from a Stephen Devlin penalty after Martin McVey had been dispossessed was the cause of some debate. Oran Cassidy’s tackle looked legal enough but from the referees position it may have looked different. That goal after fifteen minutes left Ogra 1-5 to 0-2 in front. The second half saw a few spicy exchanges but the runs of Shane Devlin and Ryan Taylor were still causing problems for the Dolans back line that sometimes struggled with the pace of the game. Just when Ogra looked to have their work done they conceded a needless penalty when Joe Gallagher was fouled. At that stage Ogra had things well in hand with a 1-7 to 0-4 lead but when Oran Cassidy made the long trip up from full back to dink the ball past Ryan McGuckin the lead was don to three. Ogra then stepped up the pace and pulled away with well worked points from Martin McVey and Shane Devlin. Both teams made a host of substitutions but the eventual result was always going to end in favour of the better balanced Drummullan men. It was another important result for Ogra who have been struggling with falling numbers but with some of their more experienced players still keeping the boots warm they look to be a decent junior team that may not be easily removed from this championship. However they will have much bigger challenges to come. Dolans keeper McGilloway made a terrific point blank save from Stephen Devlin just after Mark Collins had opened the scoring. Sammy Robinson quickly put Dolans level. Then Shane Devlin burst through the centre to give Ogra a lead they were never to lose. In quick succession Thomas Devlin, Ryan Taylor and Shane Devlin opened up a four point advantage. Then came the penalty converted by Stephen Devlin despite keeper McGilloway going the right way. Dolans made a mini revival with the next three points via Paul Melaugh, Joe Gallagher with a superb effort and a Sean O’Rourke free. In between Ogra’s finishing was poor but their half time lead of 1-5 to 0-4 still looked comfortable. Straight from the second half start Cormac Murphy pointed and then squander mania set in with Martin McVey and Thomas Devlin twice missing easy chances. They quickly got their sights adjusted and Thomas Devlin punished a foul on brother Stephen. The Dolans penalty undid that good early start but the experienced winners soon got back in the groove again with Martin McVey finishing a nice move and Shane Devlin doing similar to open up a five point gap. With 17 minutes remaining the winners were down to fourteen men when Mark Collins got a second yellow card but they got the next score through Martin McVey. Sammy Robinson and Cormac Murphy exchanged scores to leave it 1-11 to 1-6 with thirteen minutes remaining. Ciaran Wilkinson was shown a second yellow in the 50th minute. Dogged Dolans kept plugging away and were rewarded with a pointed Sean O’Donnell free. Sub Mark McLaughlin added a brace and another run from Shane Devlin was the last play of the game. 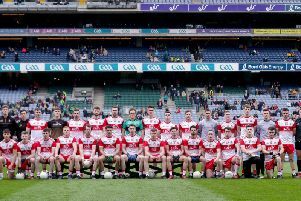 Ogra Colmcille: Ryan McGuckin, Aidan Hanna, Chris Cassidy, Declan Campbell, Shane Devlin (0-3), Chris Bates, Cormac Murphy (0-3), Conor Ward, Nico Slevin, Ryan Taylor (0-1), Mark Collins (0-1), Stephen Devlin (1-1, 1pen), Martin McVey (0-2), Thomas Devlin (0-3, 2f). (Subs) Mark McLaughlin (0-1) for C Bates (Black card), 27mins, Barry Kelly for M McVey, 45mins, Daniel O’Neill for D Campbell and Niall Martin for N Slevin both 52mins.